A Guide to the Scenery in the neighbourhood of Ashburton, Devon. Totnes Roads. The case and allegations of the Trustees of the Totnes Road Act and Creditors on the Tolls against the Bill for a Turnpike Road from Traveller's Rest in the parish of Ashburton to the town of Newton Bushell etc. Fol. A Plan of the Roads, London 1761? Rural Employments in Spring: or the Pleasures of a Country Life in Devonshire. A Poem in three Parts. Guides to Ashburton - a series of guides, produced by various organizations (eg Ashburton Urban District Council; Ashburton Chamber of Trade and Commerce) have been produced over the years. Titles vary - eg Guide to Ashburton, Ashburton Official Guide, The Ancient Stannary Town of Ashburton, Devon, etc. St Andrew's Church, Ashburton - A Guide and Short History publ St Andrew's Church Publicity and Magazine Committee. 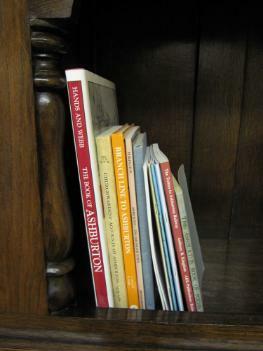 Various editions. 5th edition updated (and probably others) has a list of Vicars of Ashburton 1257 - 2011. Motor 'Buses of Ashburton, Buckfastleigh and District, Roger Grimley, revised and extended second edition, Kingsbridge 2014. Devonshire Marbles: their geology, history and uses, Gordon Walkden, Geologists' Association Guide No.72, 2015, in 2 vols. Has an in-depth investigation into Ashburton marble. Devon Parish Taxpayers 1500 - 1650, vol 1, edited by Todd Gray, Devon and Cornwall Record Society, Exeter 2016. An Enormous Reckless Blunder, Dr Ali Whiteford, Islands Book Trust, Isle of Lewis 2017. This book is about the Lewis Chemical Works, in which Henry Caunter and James Matheson were involved.